Heat treatment for industrial wooden packaging. Embalex, S.L. is listed in the Official Register of Wooden Packaging Operators who comply with ISPM No. 15, according to the Spanish Ministry of Agriculture, Fishing and Food Phytosanitary Conformity Programme for wooden packaging used for export, under entry number ES-08-0361. Created by the FAO, the International Standard for Phytosanitary Measures (ISPM) No. 15 regulates wooden packaging used in foreign trade and establishes phytosanitary measures for reducing the risk of introducing and spreading plant-based plagues and diseases across international borders. Heat treatment (HT) works by maintaining a specific time/temperature curve so that the centre of the treated wood remains at a minimum temperature of 56°C for a minimum period of 30 minutes. This process takes place in chambers designed especially for this purpose where the temperature of the wood is measured using sensors on different pieces of wood in different parts of the chamber. Hot air is circulated around the chambers in order to keep the air at a constant temperature. This system eradicates any insects living inside the wood that could cause an outbreak of disease or plague. 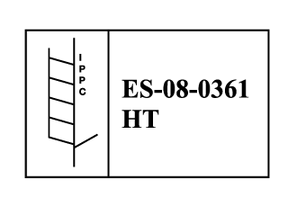 By heat treating all wooden packaging and obtaining the corresponding logo, Embalex certifies that its wooden products meet the conditions and requirements established under the International Plant Protection Convention (IPPC).